On an annual basis, more than 150 million carats of diamonds are extracted from the earth through mining. 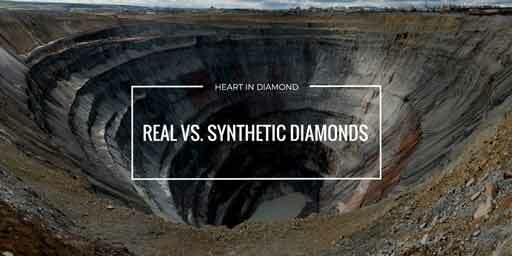 Excessive diamond mining has had devastating effects and consequences on the earth by leaving behind enormous craters. These holes create a deep, cone shaped gap in the ground that are so enormous they have the capacity to literally swallow small cities. Not only does the digging create huge gaps in the earth’s surface, many of these diamond mines generate pollution that contaminates the nearby soil or bodies of water. What are synthetic eco diamonds? The vast devastation caused by a large diamond mine is far more destructive than meets the eye. Below the surface, the craters are as vast as miniature reverse mountains that have been dug deep into the earth’s crust. Money and greed have led people to carve out the earth in a desperate search to remove every last glittering, shiny diamond from the bowels of the earth, without regard for the inevitable damage this process leaves behind. The results? Broken earth that has been sunken, dug up, contaminated, penetrated and left hollow and barren. It may come as no surprise that some of these diamond mines are more damaging to the earth than others. In this article, we cover five of the most environmentally offensive diamond mines in the world. Let’s take a closer look at their devastating effect upon our precious planet. Jwaneng. Located in Botswana, Africa, this particular diamond mine ranks as the eighth biggest diamond mine in the world. In terms of value, Jwaneng is widely considered the world’s richest diamond mine and is owned by Debswana – which is a partnership between the Government of Botswana and DeBeers. This mine is responsible for one of the largest man-made craters on earth and the surrounding region has been deeply affected and scarred because of it’s activities. The impact is more extensive than simply damage to the earth where the mining takes place, because it also produces wastewater that leaks into the water table and contaminates the soil. The mine has been operating since the early 1980’s and accounts for up to 70 percent of Debswana’s revenue, which operates four different diamond mines in Botswana. This mine produced 8.172 Mct in 2012 and 10.641 Mct in 2011, and the operating depth of Jwaneng is approximately 1,150 feet. Mir. The diamond mine Mir, also know as Mirny, is located in the Yakutia region of Russia. This mine is the third biggest diamond mine in the world and was estimated to hold more than 141 Mct of possible diamond reserves as of January 2013. The Mir mine is considered one of the world’s worst. In 2001, it was closed to open pit mining, but in 2009, underground mining commenced at this site. At it’s peak of operation, it was producing approximately 10 million carats of diamonds every single year. The crater left at the mine site is more than 1,700 feet deep, which is about a third of a mile! The opening of this diamond mine crater is a total of 3,900 feet which is approximately a quarter of a mile wide! This diamond mine is owned and operated by the Mirny mining and processing division of Alrosa. Udachny. The Udachny diamond mine is also located in the Yakuita region of Russia. Ranked by reserve size, this is considered the second largest diamond mine in the world. As of January 2013, it’s estimated diamond reserves exceeded 152 Mct. Located in the Arctic Circle, the damage caused by this mine to the surrounding permafrost is extensive, in addition to thel problem of the mine dumping pollution into the area. As one of the largest diamond mines in the entire world, and because the work is ongoing, it is expected to continue to impact the local environment severely. The mine is the property of Alrosa and run by its Udachny mining and processing division. Catoca. This diamond mine is located in Angola, and ranks as the fifth biggest diamond mine on earth. The open-pit mine is estimated to hold up to 130 Mct of mineable diamonds. Ideally located in the heart of one of the most diamond rich areas on the entire African continent, the amount of rock per carat retrieved is enormous with a ratio of 1 metric ton of rock to one carat of diamonds. The entire mine site is home to an approximate 60 million carats, and the environmental effects of the extensive mining have been disastrous. The depth of the open-pit mine is approximately 650 feet and is projected to go to nearly 2000 feet deep in the future. This mine is operated by Sociedade Mineira de Catoca which is a joint operation comprised of Alrosa, Endiama, Sonangol, and Odebrecht of Brazil. Finsch. The Finsch Diamond mine is in South Africa, near the region of Kimberley. The massive crater created by the process of diamond mining measures an incredible 1,750 feet wide and it’s over 1,000 feet deep, which is almost a quarter of a mile! This mining operation is managed by DeBeers and owned by Petra Diamonds. At Heart In Diamond, we are a company that is concerned about the environment and especially the devastating effects on the earth as a result of unsafe and massive output methods of diamond mining. We create beautiful synthetic diamonds that are guaranteed to last a lifetime and provide just as much luster, shine and brilliance as natural diamonds. Remembrance diamonds, funeral diamonds, memorial diamonds – no matter what word you use to refer to them, cremation diamonds cost less than the mined diamonds that often sacrifice the environment a result of their pursuit. Furthermore, at Heart In Diamond, we witness first hand how cremation diamonds change people’s lives by providing individuals with a unique way to deal with death, remembering their deceased love one with a treasured keepsake. Turning ashes to diamonds is an environmentally-friendly way to create a stunning diamond without the travesty of destroying the earth in the process. Our lab-grown diamonds are virtually indistinguishable from a natural, earth-created diamond and consist of the exact same physical and chemical properties of those that are mined. Go with the “green” choice and choose one of our beautiful cremation diamond types and help put an end to the damage caused by commercial diamond mines.